Some real highs and lows for Sabrina in this episode! On the one hand, consequence-free superpowers. And on the other hand, she’s the Herald of Hell. Sadly, it does not appear to be the case that Sabrina’s destiny is to spread her father’s more peaceful doctrine amongst mortals and witches. As she puts it, tearfully, “I am evil.” But it’s hard to imagine, in a series so intimately concerned with the Bible, that free will is not going to enter this equation in some way. No matter how far down the path to the Dark Lord’s church she’s gone, she’s always been concerned with doing the right thing. And not in the sense that she’s trying to earn brownie points—she genuinely seems to want to do and be good. Whether or not she can overcome her own fate in this regard is another matter. As per usual, Hilda is right about most things, and everyone else is just playing catch up. She correctly intuits what’s going on with Zelda, not that it’s that hard to figure out something’s amiss there. 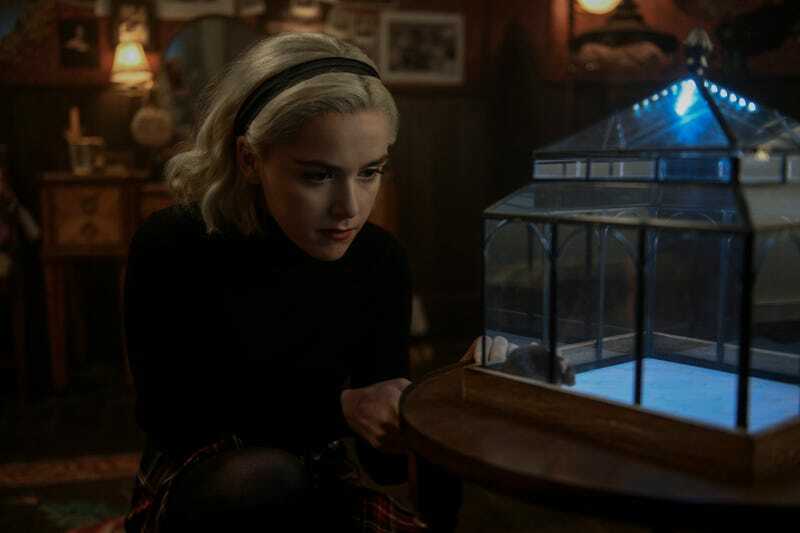 And she repeatedly tries to warn Sabrina that there’s no way all the magic she’s doing won’t have some kind of repercussions. So far, those haven’t arisen, but it’s not hard to imagine this affecting Roz, whose healing has much longer term effects than Sabrina’s impulsive improving of the weather. It’s all quite a come down for Sabrina (in one case, quite literally). At last, all the answers seemed to be there. She could lead the Church of Satan to the best version of itself. And along with her aunts, she could save Ambrose and head off Father Blackwood, at least temporarily. At bare minimum, it was nice to see the Spellmans finally getting the best of him after he’s put them through so much. He’s undoubtedly not completely defeated at this point—he’s far too crafty for that—but for once, they came up with a plan that he wouldn’t anticipate and executed it flawlessly, getting Ambrose out of danger and de-throning Blackwood in the process. One of the bigger questions at the moment is where Prudence’s loyalties lie. When she tells Ambrose she wants to know what Sabrina is, just for herself, it’s hard to know whether to believe her. And now she’s the only person who witnessed Sabrina’s minor miracle. Will she eventually stand by her father, or is Sabrina going to win her over? The back and forth between the two of them has long been uneasy. As she pointed out in the last episode, they’re not exactly friends so much as people whose purposes are occasionally aligned. Prudence may be a lot more confident than Sabrina, but there’s a parallel in the way she’s also trying to figure out who she wants to be in the world. Does she want to be a Blackwood? Does she like the idea of a new kind of church? It’s hard to say, and Tati Gabrielle’s performance remains complex enough that she’s the rare CAOS character where you’re not sure where her loyalties are from moment to moment. And it’s not because she’s opaque (ahem, Nick), but because she doesn’t always seem certain herself. The biggest upside to Sabrina discovering the truth about herself is that her proselytizing was getting old in a hurry. Turning her into a messiah would have been about as unpleasant as Father Blackwood seems to think it would have been. This new discovery opens up quite a lot of avenues for the show to explore with her. She’s clearer about who her enemies are, but one of them may be her own nature. How long can she maintain the status quo in order to figure out what comes next? And how long before Satan comes calling to discuss some potential new responsibilities for her to take on in the world? We don’t know what the Herald does, exactly, but it doesn’t seem like healing the blind is going to continue being one of her top spells. Why in the world did the school for the blind have to be a scary nightmare place? What is wrong with Roz’s father? The Theo/Harvey subplot took one expected twist–the woman in white, unsurprisingly, tries to kill them when they explore the tunnel alone—and one more unexpected one, as they manage to kill off whatever that creature was and discover what she’s hiding. The mortals are getting better at managing things on their own. Poor Leviathan. Died horribly once only to get brought back and killed horribly a second time. Harvey certainly seems to have a knack for saving Sabrina from herself.